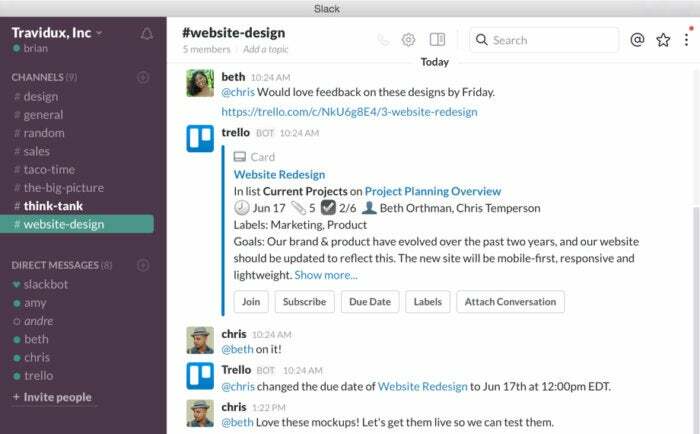 Trello has grown quickly since it spun off from software firm Fog Creek three years ago, adding millions of users every few months. And it shows no sign of slowing since its acquisition by Australian collaboration software firm Atlassian: it now has 25 million user signups, up from 14 million last year. What’s driving interest in the work management application? One of the notable elements of Trello’s growth has been its ‘viral’ adoption across organizations. That makes it similar to tools such as Dropbox and Slack, which also relied on end user adoption for growth rather than top-down corporate software roll-outs. “A product like Trello is showing the way for a new way of doing things, and I really think that will become more widespread with enterprise software,” said 451 Research senior analyst, Raul Castañon-Martinez. 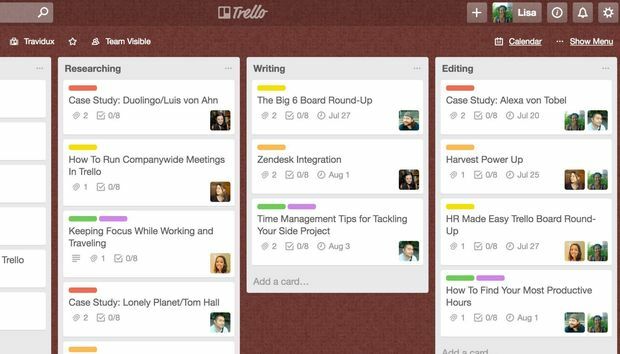 Trello started off in January 2011 as a prototype from Fog Creek, aimed at solving “high-level planning issues,” according to the company. It was launched at TechCrunch Disrupt later that year and then spun off as its own company, with Fog Creek co-founder Michael Pryor as CEO. It is one of a variety of collaborative work management tools that have grown in popularity in recent years. Others include Asana, Workfront, Smartsheet, Planview and Projectplace; Microsoft has also launched a Trello rival, Planner. 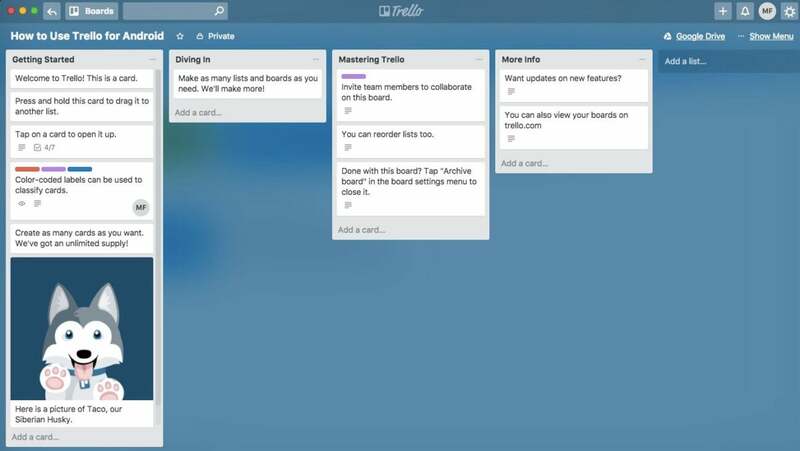 Trello and its rivals differ from full-featured project management tools such as Atlassian’s own Jira software or Microsoft Project, however. Instead, they prioritize lightweight functionality and accessibility over a broad feature set. 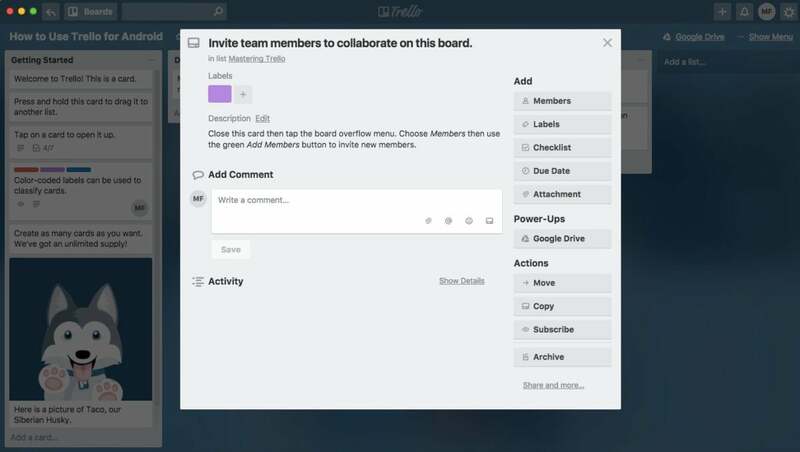 Trello’s initial use case has been for small teams of up to 10 people, or even for personal use. “Unlike project management applications like Microsoft Project that target traditional project managers, Trello can be used across the organization by anyone that needs to manage projects but does not need or want a specialized – and complex – project management tool,” said Castañon-Martinez. Trello draws on the principles of Kanban, a method of visualizing workflows to provide an overview of a project from start to finish. This is done using Trello’s boards, lists and cards. A board will typically focus on a specific project such as launching a new website, or more process-based tasks such as on-boarding an employee. Each board contains lists which may, for example, indicate the progress of a project. Lastly, cards within the lists hold information on a specific task, and can be moved from list to list when completed. There are a variety of options to collaborate with team members, with capabilities to discuss projects from within cards and to upload relevant files. Another key feature is integration with other applications – what the company calls “power-ups.” These API integrations allow users to access features such as Google Drive, Slack and Salesforce directly from Trello. It is not only a business task management tool, of course. Trello is widely used for personal itineraries, including anything from planning holidays to weddings; that versatility has been a major part of its appeal. Trello has three pricing tiers: Free, Business Class and Enterprise. The free tier requires users to sign up, and provides access to unlimited boards, lists, cards members, checklists and attachments. However, there are limits, such as one power-up per board, and restrictions on file sizes (no more than 10MB) that can be attached to a project from their computer. Any file can be linked from Google Drive, DropBox, Box or Microsoft’s OneDrive. There is also a premium Trello Gold option for individual users, which provides wider access to features such as board backgrounds, stickers and custom emojis. The Business Class option – $9.99 per user per month, when paid annually – has unlimited power-ups, allowing users access to the full range of integrations with tools such as Slack, Salesforce, GitHub and others. This tier also allows files of up 250MB to be attached to cards. There are also a range of security features to appeal to IT admins. This includes one-click access removal for former members, control over who can create public and private boards, and restricted membership invitations. Priority email support is also provided, with a guaranteed one-day response time during business hours. There is also better support, with on-boarding assistance and priority email and phone support, as well as access to a dedicated account executive to streamline training. The Enterprise version has a range of pricing plans depending on the number of users. It starts at $20.83 per user a month, but can drop to as low as $4.17 per user for more than 1,000 users. Despite some wariness about the high price, Atlassian’s $425 million purchase of Trello on Jan. 9 has generally been seen as a smart move. The move, Atlassian’s largest purchase to date, was seen as an effort by the company to head off a threat to its own portfolio, and a way to gain access to a broader customer base outside of its focus on technology teams. “Now under Atlassian, we have the resources to bring things to market faster and can deliver some of our most exciting features yet, like the desktop app,” he said. Previously Trello had been available either via a web browser or a mobile app. Last week’s Atlassian Summit offered a glimpse at how Trello may continue to evolve, pointing to further integrations with its parent company’s portfolio along with improvements to user experience. Atlassian keeps dedicated R&D teams for each of its products, even after acquisitions, but also employs a core group to work on features that will be available across its product set. Castañon-Martinez expects that Trello will become part of a more comprehensive portfolio of collaboration products that will help Atlassian better take on rivals such as Microsoft and Cisco. One challenge for Atlassian is to ensure that, at the same time it adds new features, it does not create complexities that detract from one Trello’s main selling points: its simplicity and accessibility by a broad range of users. “That is a challenge not just for Trello but for any of the collaborative work management products,” said Visitacion. According to a recent Forrester survey, only 3% of information workers get their primary data from a project management tool, as they are designed specifically for those with direct expertise in that area. Castañon-Martinez does not see over-complexity as a coming problem, however, given Atlasssian’s success in adding new software to its portfolio in the past. “If you look at the history of how Atlassian has acquired and then incorporated new companies, they keep their product team and they don't make radical changes in terms of how the product was evolving,” he said.